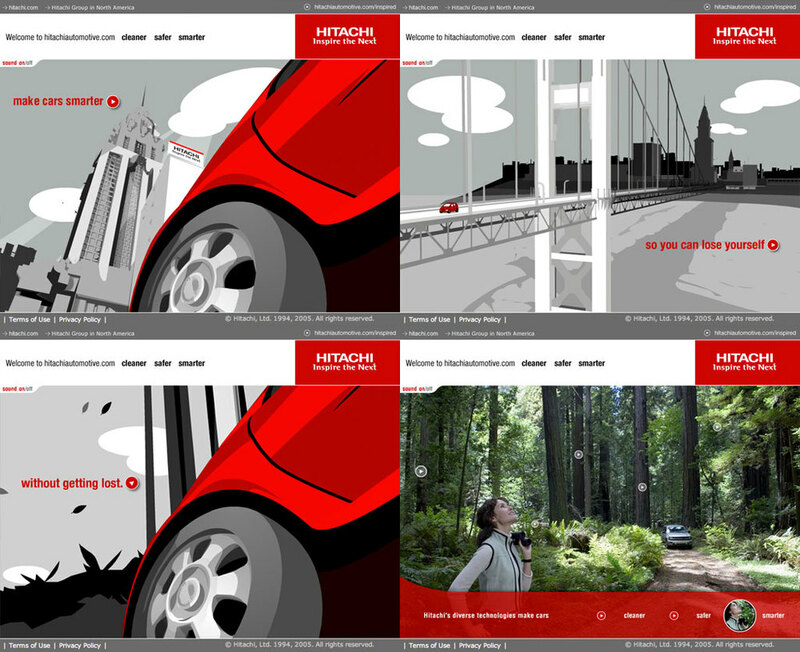 Hitachi’s North American automotive division needed a B to B site that would clearly present their new approach to automotive production with an online experience that was as attractive as it was informative. McCann SF approached Exopolis with an incredibly short timeline to tell three stories for Hitachi: Cleaner, Safer, and Smarter. We created three unique vignettes in 3D and rendered as vector graphics to maintain minimal file size without sacrificing design or motion. Each of the three animations resolve to a photographic image with hot-points that explore what Hitachi brings to automotive technology. We added small photo-real animated elements such as planes, birds and falling leaves to create ‘living’ environments. We created subtle, ethereal audio in-house, including sound effects and music, helping to create a unified voice for the site. Having control over this aspect of the job allowed us to synch the visuals and the audio together thematically to present a cohesive tone throughout the experience.